RETIRE IN STYLE BLOG: Downsizing Green...an attitude adjustment! Living small with beautiful reused things! Downsizing Green...an attitude adjustment! Living small with beautiful reused things! I have never been willing to live without beauty. My husband knows that, even if an item serves a perfectly logical purpose, I will have no part of it if the item is ugly. Even my kitchen tools are beautiful, hard won, inexpensive and useful. Living small does not mean living a cluttered, messy and dysfunctional lifestyle. I guess that is why I love websites like Apartment Therapy and all that is related to it. Re-nest is the branch of that site that I find myself visiting more and more often. The tag line for the website is abundant design for green homes. They are finding ways to create beautiful green small spaces. I love the idea. A friend said she was finding it hard to visualize moving to a smaller place. I had been talking about moving to a smaller condo here in Oregon as soon as real estate takes a turns for the better. She thought she could not imagine how I would ever part with all my beautiful things. I remember feeling puzzled...what "things" was she talking about? Was it the furniture or the glassware or the bedstead? What did she see of mine that was so precious? The fact is we would never continue to live in a place that did not fit our lifestyle or even worse cause a burden or problem for my children? I know she would make the same decision if she saw the need. This is what I mean by the attitude adjustment. Truly, I have never been a hoarder of personal possessions and I don't feel validated by the fact that I have this or that. We are still using things from my mother's and grandmother's house for heavens sake. Our generation are the original founders of the reuse, reduce, recycle movement. We have been married for 50 years! I give things to my children with no string attached and they are free to burn them if they see fit. I truly don't care. I would never keep a broken or chipped item just because it has a memory. Stuff is stuff! But I do think that a lot of retirees that need to down size face the problem of letting go of their past. My husband and I are very lucky in that we are willing to visit books at the library, have never invested a great deal in our furniture and keep our memories in the picture box not the cupboard. Yard sale chairs, dining set 45 yrs. old, lamp shade from Antropology sale table, mirror was my grandmothers, curtains 10 years old...just for a start! Finding these things was a lot more fun than having them...that dining set is a bear to dust! A SMALL IDEA FOR BEAUTY IN A SMALL SPACE! Re-nest is based on the concept of green living and recycling....well almost anything. 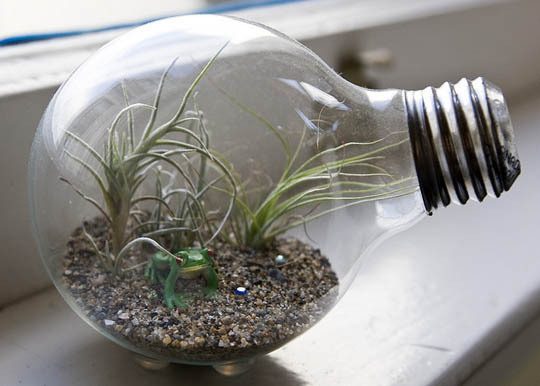 Today I saw an article from them featuring a light bulb terrariums from Tiny Terra. A terrarium is a micro-climate created by putting a cloche over a plant either in the ground, on a hard surface or inside a container. In this particular case the terrarium was a light bulb! One of the tags on the article was "creative reuse"...and creative this is. I have one of these little micro-climates on my dining room table this summer. I used what I already had, a bell shaped cake saver I purchased at Crate and Barrel several years ago, to cover the plants. The vase I found on their website today would work every bit as well. Plant your small plant in a glass bowl or a stemless wineglass. Put a few pebbles in the bottom of the dish/glass then save enough soil from the plants container to fill the bowl and add your plant. I have a Wire Plant in one container and a delicate Begonia in another. I watered them just enough for them to be damp, placed the planters on a glass table round and covered them with the cloche. I have not watered them again all summer. Steam gathers inside the cover and that steam provides the needed moisture for the plants. It is a Biosphere III anywhere I want to place it in my house. So living small, simply and with the right attitude can be a beautiful, stylish way of living. All we need to do is readjust our attitude to fit the space. Check out Re-nest and Apartment Therapy for more ideas. I think you will find them as inspiring as I do. You're so right about the attitude adjustment that goes along with downsizing. My husband and I have always kept everything from old magazines that had an article we liked to bits and pieces of things we might need someday. Right now we live in a 2400 square foot house but when we retire in a year or two, we will go to a 1400 square foot house. Our goal is to simplify our lives so that we can comfortably fit into that space and we are starting now by giving things away. Our kids now have their own homes so they are getting the family heirlooms to keep, little things I saved from their childhoods and so on. Once you get into that mindset of simplifying, it becomes also satisfying.